Doc Pomus was the unlikeliest of rock & roll icons. Paralyzed with polio as a child, Brooklyn-born Jerome Felder reinvented himself first as a blues singer, renaming himself Doc Pomus, then emerged as a one of the most brilliant songwriters of the early rock and roll era, writing “Save the Last Dance for Me,” “This Magic Moment,” “A Teenager in Love,” “Viva Las Vegas,” and dozens of other hits. For most of his life Doc was confined to crutches and a wheelchair, but he lived more during his sixty-five years than others could experience in several lifetimes. 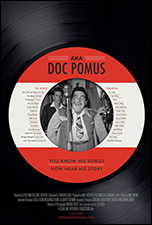 AKA Doc Pomus brings to life Doc’s joyous, romantic, heartbreaking, and extraordinarily eventful journey. In his later years, Doc was a mentor to generations of younger songwriters, and a fierce advocate for downtrodden rhythm and blues musicians. He wrote a thousand songs – including some of the most recorded songs in the history of popular music – but his most lasting gift may have been his uniquely generous spirit. “If the music industry had a heart,” the record producer Jerry Wexler remembered, “it would be Doc Pomus.”Packed with incomparable music and rare archival imagery, AKA Doc Pomus features interviews with Doc’s collaborators and friends, including Dr. John, Ben E. King, Joan Osborne, Shawn Colvin, Dion, Leiber and Stoller, and B.B. King. Passages from Doc’s private journals are read by his close friend, Lou Reed. Doc Pomus’ gripping life story makes for a powerful and lively film that introduces this unique American character to a new, much wider circle of admirers. DOC POMUS 1990 INTERVIEW COURTESY OF THE STUART GOLDMAN CO.
REELIN’ IN THE YEARS PRODS.